Travelling with a toddler is always an adventure! They’re at the age where they can remember Grand Parents, sights, and sounds but their sleeping arrangements become more complicated. 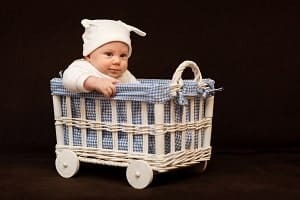 When our son was an infant, it was fine to use a travel bassinet and then a pack and play. The problem is bassinets and pack n plays get too small too quickly! Being able to make your toddler feel comfortable in strange places is a real problem. 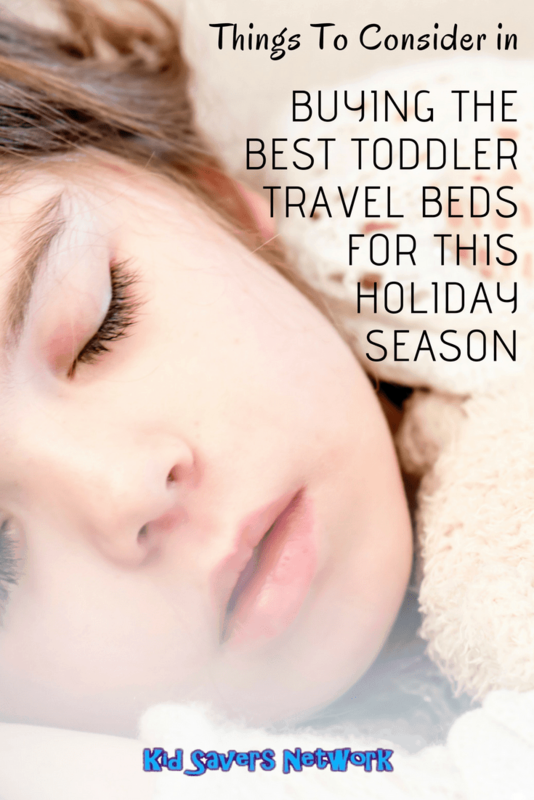 That is why a toddler travel bed is a great idea. 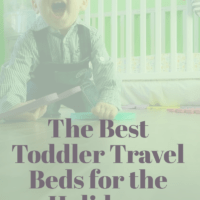 On this page, we’ll take a look at the best toddler travel beds and the things you need to know before buying one. Inflatable beds tend to be the most popular type. As you’d imagine, each kind offers different pros and cons which we’ll discuss further. An inflatable toddler bed makes a lot of sense if you’re looking for something to travel with. They are quick to inflate and light and easy to carry when you’re on the move. The top rated inflatable beds are strong and durable, too. This is a key point as you don’t want something that will burst if a cat walks across it (black or otherwise!). Lots of manufacturers will also include a repair kit just in case you do catch it on something. Inflatable toddler beds tend to follow the same design. Basically, a blow-up mattress with side bumpers to stop toddlers from rolling out. However, there are some features you need to look out for. Some inflatables come with a manual pump only. You’ll have to pay extra for a faster (and less tiring) electric pump. It’s better if the sleeping area is standard crib size (28” by 52”). This means you won’t need to buy extra bedding and your toddler can use the covers they are used to. Toddlers need effective side bumpers to stop them from rolling off the bed. If you’ve ever slept on the flat adult ones. you know how easy it is to bounce right out! A problem with sleeping on plastic is that it can feel cold and stick. A lot of the best inflatable toddler mattresses have a soft material added for their comfort. If toddlers aren’t potty trained, it’s a bonus if the mattress is machine washable. Getting things like tents and inflatables back into small bags quickly is a real hassle. Look for inflatable beds that deflate quickly and easily so you can get on the road. The Shrunks portable inflatable mattress is an extremely popular travel bed for toddler and parents alike. They have reported using this model for children from 18 months to 6 years old. The Shrunks portable has an inner mattress and security rails (which inflate separately) to stop your child from rolling off. Inflation is incredibly quick at under 1 minute with the electric pump provided. This is much faster than comparable mattresses and great for when you’ve just finished a long journey with tired children. The inner mattress is the same size as a standard crib. 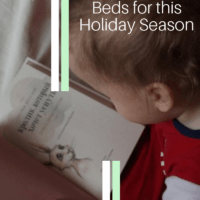 It’s a really neat design because you can tuck in crib sheets and covers and they stay in place This means your toddler can take their own bedding when you travel (and saves you from buying new linen too). The mattress is non-toxic, BPA Safe and lead-free. Shrunks have added a velvet-like material so it doesn’t squeak when your child moves around. That’s something a lot of inflatable mattresses don’t have. An area many parents worry about is deflating these kinds of mattresses and getting them to fit in the small bag. Trust me, when checking out of a hotel with kids in tow you want things to be as simple and easy as possible. The good news is you can deflate this inflatable mattress quickly using nozzles which come with the pump. There’s also flaps that you press in the mattress to help get all the air out. When deflated and in it’s bad it’s about the size of a rolled-up yoga mat. The bag itself is no bigger than a small duffel and weighs 13lbs deflated. So you can take it on a plane as hand carry or as part of your checked in luggage without any problems. Some things you need to be aware of is that the mattress is not waterproof. It does handle toddler “accidents” o.k and has the added bonus of being machine washable. Another area of concern is the smell of plastic. Reading through the reviews many parents said it didn’t smell out-of-the-box. Some did. They also said they inflated and then deflated it and that seemed to help. Shrunks provide a two-year warranty so they’re confident you’ll be able to get a lot of mileage out of their product. You can find it for sale online here. Intex is a famous brand in the Inflatable Boat industry, so they’re skilled at building inflatables that can take a bit of punishment! The Kidz travel bed is a slightly different design to Shrunks, more like a “Boat Bed”. It comes in two pieces – the sides and bottom and the inflatable mattress insert. The mattress is the size of a standard crib. This means you can use your crib bedding with this model. Although the recommended age is 3 years old, most parents have been using the Kidz bed from around 18 months to 5 – 6 years old. As you can see, your child will be fully enclosed so it’s much harder to roll out of this bed than the Shrunks. When researching these beds I read a few complaints about the plastic being “Cold and uncomfortable”. Intex have tackled this problem well by adding a suede-like lining to the mattress. Something you need to know is there is only a hand pump included. This means it takes between 5 to 10 minutes to pump up both pieces (depending on how much of a workout you want!). This could be ideal if you’re going overseas and worried about travel adaptors. However, many parents get a cheap electric pump and are much happier. The way you deflate the Intex Kidz is how you’d imagine. Simply roll it up and squeeze the air out of the valve. It compacts down to a small size and weighs just 9lb. Perfect to take on a plane a carry-on baggage. How about the smell? Well, like the other inflatable beds there is one, but if you hang it out for 24 hours it should go away. If you’re looking for the fastest inflatable toddler bed on the market, it’ll be hard to be the AeroBed. This model inflates at under 60 seconds with the included pump. The pump is “2-way”, so it also takes just 15 seconds to deflate! Perfect for when you need to get out the door quickly. Or I should say “less slowly” with toddlers! The Aerobed is a similar design to the Intex, a bit like a “boat bed”. It has 4” raised sides to stop toddlers from rolling out. It comes with a soft, flannel cover that is machine washable. It’s very cute with a “moon and stars” design. The cover stays in place with the help of some elastic straps. One thing that stands out in particular with this product is how durable it is. Some parents have been using it from toddler all the way up to 8 years old! It also deflates to about the size of a sleeping bag and weighs about 7lbs. So it’s perfect to travel with. Again, the instructions say “3 years old”, but a lot of parents use it for their younger toddlers. As there are no small parts, I don’t think choking hazards are a concern. You need to know that the cover itself is bigger than a standard crib sheet. You can use twin sheets with this Aerobed, but they’re a bit baggy. This could be a deal-breaker if you’re going on extended trips. You also might not think the 4” bumpers provide a big enough barrier. In which case, the Intex or Shrunks design might be better. If you don’t want the hassle of an inflatable bed, the Kidco Peapod Plus could suit you and your toddler better. Toddlers love tents and using sheets to make pretend tents. So getting them into the Peapod Plus shouldn’t be a problem. But how practical is its design as a toddler travel bed? Well, the first advantage is it doesn’t need a pump. At just 5lbs it’s also much lighter than a pack and play and almost half the weight of most toddler inflatable beds. 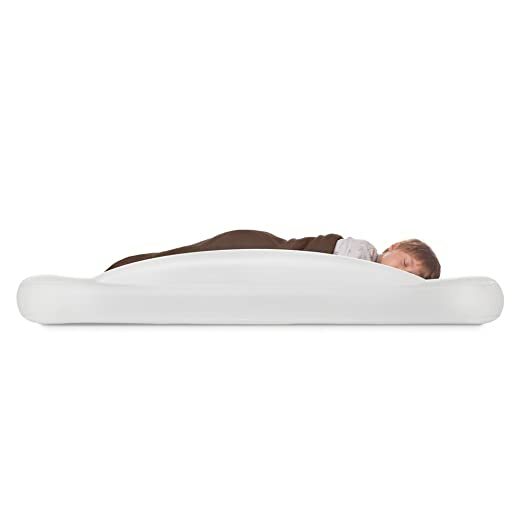 A micro-lite mattress pad that snaps to the bottom of the outside of the PeaPod. This makes the sleeping area about the same size as a pack and play. As the pad is on the outside, you can’t really put a sheet in there. The pad is soft enough, and a lot of parents do add a blanket depending on the age of their child. You can use the bed from one to five years old. Many parents begin to use inflatable beds from around 18 months so the peapod has got a 6-month head-start on them. The design makes the Peapod Plus great for trips to the park, camping or the beach. It has UV protection to provide shade and the inner mesh will protect your toddler from bugs, too. The Peapod has an outer door-flap an inner mesh. This means you can roll-up the outer door for more air circulation. However, to check on them you need to get down to ground level on all fours! Another drawback to the PeaPod is you can’t put it on top of a bed as it might scoot off. It needs to be on the ground. And lastly, folding it up is a bit tricky! Here is a video so you can decide for yourself! Another alternative to an inflatable bed is a travel cot. Their big selling point is their simplicity. There’s nothing to burst or pump-up. And at just 5lbs it’s even lighter than the Peapod. They fold up like a lawn chair so they’re perfect for travelling with. The Regalo My Cot comes with a fitted sheet which is machine washable. The material of this cot is like you see on most folding lawn chairs. So if your toddler’s diaper leaks or something gets spilled it can be wiped down and dried easily. If (like me) you’ve had a rough sleep on similar camping cots you’re probably wondering about comfort. The good news is, Regalo have designed this like a hammock. The center bar is slightly lower than the end bars so it won’t dig into their little backs. Finally, the best thing about the Regalo Travel Cot is the price! 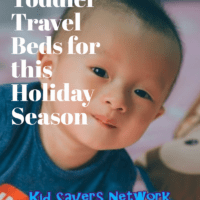 They are much cheaper than the other types of toddler travel beds. The sleeping area of theMy Cot is a little bit smaller than a standard crib (58 by 28). So if you put a crib sheet on this cot it will hang over the edges. What quite a few parents do is use a regular sheet and fold it in half. Or use a toddler sleeping bag. Like most cots, it’s off the ground. This will be a concern if you have a restless toddler who rolls over a lot. The distance is only 7 inches so other than waking up they are unlikely to hurt themselves. To prevent this from happening, some parents place the cot in between a bed and a wall wherever possible. I must say, I find the short 90-day warranty a concern. With something that folds and compacts I’d expect longer. However, there are quite a few parents saying these travel cots last a long time. For the price especially, it’s not too concerning. Looking for something for daycare, pre-school or Kindergarten? Check out our page on kindergarten nap mats!